***The following post was authored by NAHB’s Economics and Housing Policy Group’s summer intern, Emily Condos. Value Added Taxes (VAT) are a reliable source of revenue for many governments, with the United States being a notable exception with respect to their use. The taxation of housing is a key element in designing a VAT. An overly broad tax base with respect to a VAT could put unneeded pressure on the construction and remodeling industry and hamper home ownership. In countries that use a VAT, a number of policy options are used to address this concern, including varying rates and establishing exemptions with respect to the payment of rent. Other factors include the VAT treatment of remodeling and construction of owned and rental housing. A Value Added Tax, sometimes referred to as a Goods and Services Tax (GST), is different than a sales tax. In a VAT system, only the value added to a product is taxed at each level of production. This means that the end-consumer will bear the full burden of the tax when purchasing the final good or service; however the producer will only remit that portion of the final tax equal to the value added to their final product. That is, if a business purchases a good as input for production, the tax it pays for its purchase may be deducted from the tax it charges to the consumers of its products. A VAT thus avoids the problem of tax pyramiding associated with sales taxes, where the final tax burden grows exponentially with the number of production transactions prior to final sale. For this reason, and other administration concerns, many countries in the Organisation for Economic Co-Operation and Development (OECD) have switched to a VAT. VATs in the OECD average 18% on most consumption goods. Figure 1 depicts the rate of the VAT in each country and the revenue as a percent of GDP that the VAT brings in. As shown above, the US currently does not have a VAT. 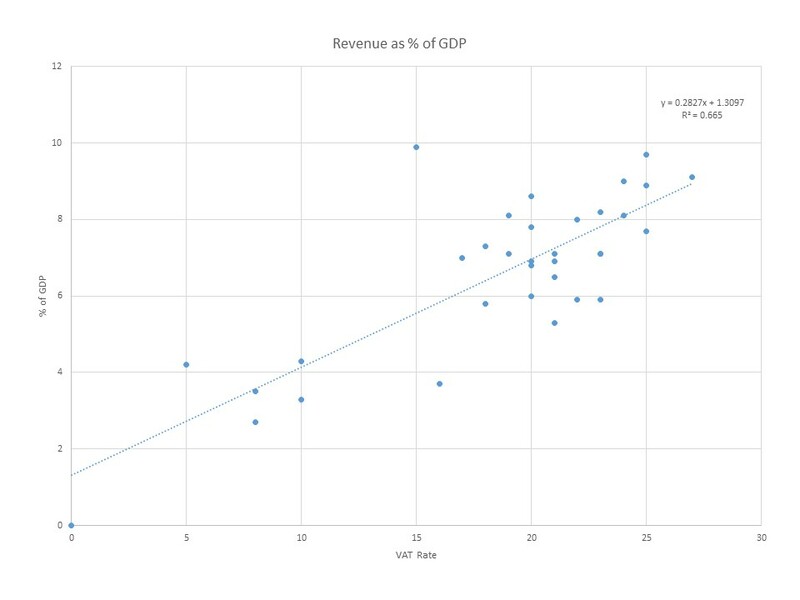 In figure 2 below, revenue as a percent of GDP is graphed against the VAT rate. Using a linear regression model, the expected revenue value is 1.3097+0.2827(VAT). According to the most recent ONESOURCE Indirect Tax report from Reuters, the average US sales tax is 5.45%, including the states that have a 0% rate. If the same rate is implemented as a VAT, the regression predicts that the revenue as a percent of GDP would be 2.850% instead of the current amount 2.0% found on the OECD statistics database. This percent is an increase of 42.5% of revenue from that one tax. It is worth noting that a VAT offers other benefits over a conventional sales tax for industries that are relatively less vertically integrated. Such industries involve many intermediate goods transactions, which under a sales tax would involve a relatively larger amount of sales tax revenue, causing costs to consumers to rise. When defining a VAT, a key test is the treatment of the various housing related items of the economy. In general, most nations with a VAT do not tax the payment of rent. However, new construction is taxed as a “prepayment” of the future flows of rent (including imputed rent that homeowners theoretically pay themselves). It is worth considering, however, that such prepayments create an asymmetry when a new VAT system is adopted. Existing homes remain untaxed, while new construction is subject to a tax. There are useful examples of housing rules for nations that have VATs. According to the Canada Revenue Agency, residential rent is not taxed on the standard 5% VAT rate. However, new construction, significant remodeling, and utilities in houses are taxed at the 5% rate. Similarly, in Australia, property is taxed. Pre-owned real estate in Australia is exempt from the rate and instead of being exempt, rental income is “input-taxed.” This means that instead of having a 0% rate like Canada, rentals would have the normal 10% rate which could then be used as a tax credit if filed. Newly constructed residential property is taxed at the 10% rate. A country with a high VAT rate is the Netherlands, which taxes at 21%. This is interesting because unlike some countries with lower rates, the Netherlands taxes all parts of the housing market including property, construction, and rent. This is also true for most Nordic countries. These high rates deter people from purchasing newly constructed homes or in some cases doing much needed reconstruction or remodeling. According to a paper by the Government Accountability Office, France also taxes on the sale of newly constructed or residential renovations as does New Zealand. Both countries treat rent as exempt or mostly exempt. The UK however has a less strict tax structure where rent is exempt and sale of residential property is zero-rated. According to KPMG, only a reduced rate of 7% is used on rentals in Germany. This is down from the normal rate of 19%. Newly constructed homes and sales of existing homes are not exempt and taxed at the 19% rate. Japan also gives exemption from the VAT to rental leases and existing property, although it keeps the 8% tax rate on newly constructed homes. It will be interesting to see if this exemption continues or grows when the VAT rate increases to 10%. 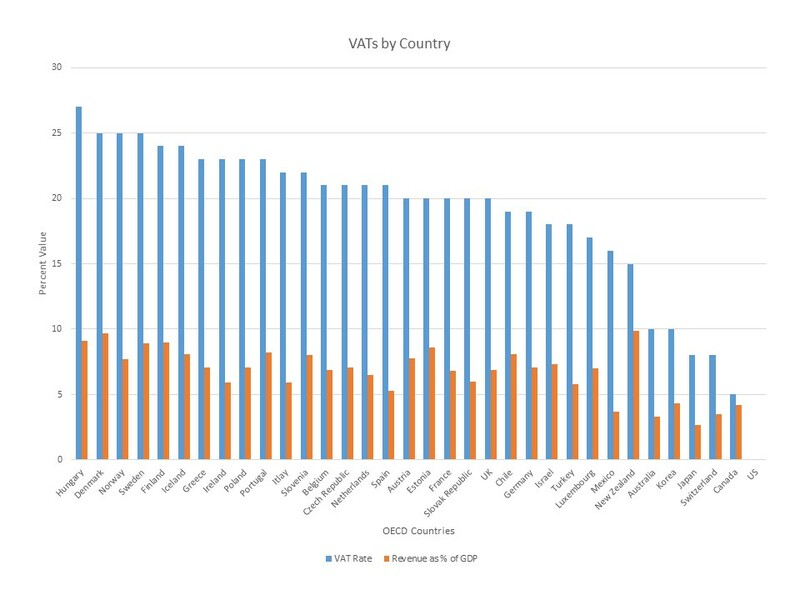 Although there is not significant data on how VAT rates affect housing, the data from OECD countries show it is something that must be looked at when deciding whether or not to implement a VAT in the United States.